The director of the National Center of Epidemiology, Gladys Ramirez, said that Lima has the highest number of influenza AH1N1, followed by Piura, Puno, Cuzco, Madre de Dios, and Tacna. The Peruvian doctor, Elmer Huertas, said that the Minsa data show that hundreds of children in the high Andean areas die every year from lung complications caused by common respiratory infections triggered by the cold, such as colds, flu, and bronchitis. According to a recent study released by University of Oxford scientists, it is not just about the low temperature, but poverty and malnutrition, which does not allow children to form an adequate amount of defense cells and antibodies to fight against viral infections common in the winter. This season's frost arrived earlier than usual and has already affected more than 32 000 Peruvians in 11 regions of the country. 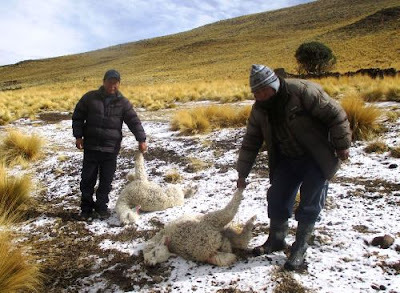 The Peruvian doctor, Elmer Huertas, said that the Minsa data show that hundreds of children in the high Andean areas die every year from lung complications caused by common respiratory infections triggered by the cold, such as colds, flu, and bronchitis. "That is, children in these regions die of pneumonia, " he explains.